Cleaning your eyeglasses daily is the best way to keep them looking great and prevent lens scratches and other eyewear damage. But there’s a right way — and plenty of wrong ways — when it comes to how to clean glasses. For touch-up cleaning of your glasses when you don’t have the above supplies available, try individually packaged, pre-moistened disposable lens cleaning wipes. These are formulated specifically for use on eyeglass lenses. Don’t use any substitutes. Which brings us to a very important topic — what NOT to use to clean your glasses. If tap water isn’t available to rinse your lenses before cleaning them, use plenty of the spray eyeglass cleaner to flush away dust and other debris before wiping the lenses dry. If your lenses have anti-reflective (AR) coating, make sure the eyeglass cleaner you choose is approved for use on anti-reflective lenses. When using individually packaged, pre-moistened disposable lens cleaning wipes, first inspect the lenses for dust or debris. Blow any particles off before wiping the lenses, to avoid scratching. Microfiber cleaning cloths are an excellent choice for cleaning glasses. These cloths dry the lenses very effectively and trap oils to avoid smearing. But because they trap debris so effectively, make sure you clean the cloths frequently. Hand-wash the cloth using lotion-free dishwashing liquid and clean water; allow the cloth to air dry. Unfortunately, there is no magic cure for scratched lenses. Once your glasses are scratched, they are scratched. Some products are designed to make the scratches look a little less visible — but these are essentially waxy substances that wear off easily, and results are mixed, depending on the location and depth of the scratches. Also, these products often will smear lenses that have AR coating. In addition to reflecting light and interfering with vision, scratches can affect the impact resistance of the lenses. For optimum vision and safety, the best thing to do if you notice significant scratches is to purchase new lenses. When purchasing, choose lenses that have a durable scratch-resistant coating. And ask your optician if your purchase includes an anti-scratch warranty — especially if scratched lenses have been an issue in the past. If your lenses are in good shape but the nose pads or other components of the frame have become impossible to keep clean, see your eye care professional. Sometimes eyeglasses can be cleaned more thoroughly with an ultrasonic cleaning device, and yellowing nose pads can be replaced with new ones. See your optician before attempting these fixes at home. Eyeglass lenses can easily get scratched if you fail to store them somewhere safe. This includes when you take them off at bedtime. Always store your glasses in a clean eyeglasses case, and NEVER place them on a table or counter with the lenses facing down. If you don’t have a glasses case handy, place your glasses upside down with the temples open — somewhere safe, where they won’t get knocked off a table or countertop. All eyeglass lenses will get a few scratches over time from normal use and exposure to the environment. (And from occasionally getting dropped or misplaced.) Eyeglasses lenses are scratch resistant, not scratch-proof. 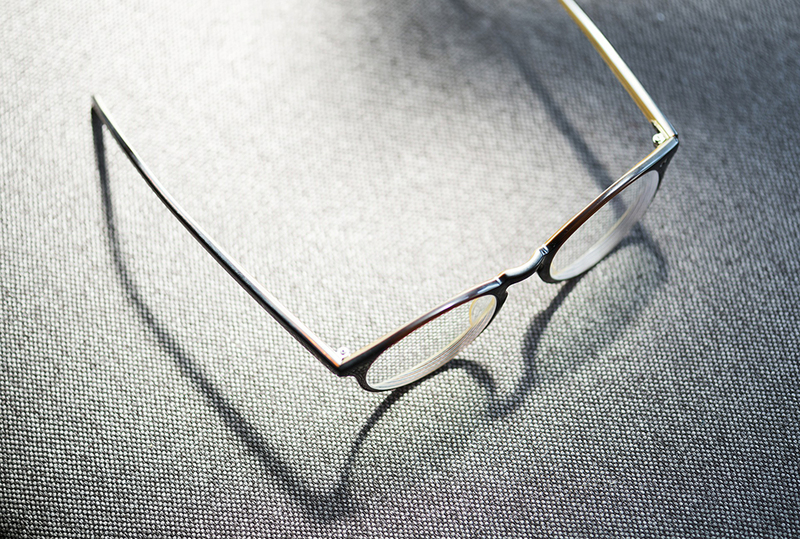 When purchasing glasses, ask your eye care provider about anti-scratch warranties for your lenses. This is especially important for children’s eyeglasses or if you wear glasses in dusty conditions. Following the above tips is the best way to keep your glasses clean and scratch-free for as long as possible.